Whether you're in an elevator, on a party or walking somewhere with somebody... there's always that weird moment when nobody's talking, because nobody knows about what. How to talk with a stranger? What to talk about with a business partner? How to speak to your crush? 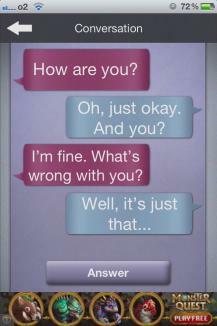 The Smalltalk-app will help you find the right words for those moments and start a conversation. 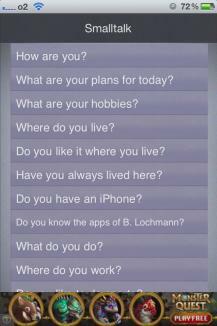 You'll get conversation topics for various situations, no matter who you're talking to. "What do you have planned for today? ", "What are your interests? ", with the right lines, you'll get every conversation going easily. 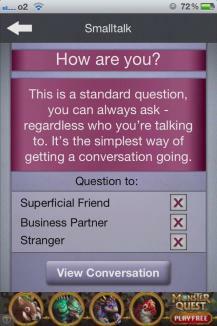 Get Smalltalk now and end those awkward moments once and for all!